A new survey on British social attitudes shows that the Anglican Church lost 4.5 million followers over the last decade, while people who say they have no religion account for half the population and the number of Muslims now stands at 5 percent. The findings from NatCen’s British Social Attitudes survey released Sunday show a dramatic shift in religious beliefs in the UK over the past ten years. 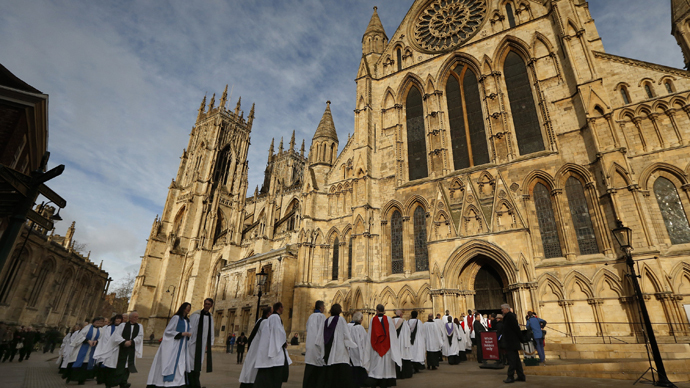 While the Church of England has been in decline for the last 30 years, the past decade showed a massive acceleration in this trend and the number of Anglicans in Britain now stands at just 8.5 million or 17 percent of the population. It used to be 40 per cent in 1983. The former Archbishop of Canterbury Lord Carey voiced concern over the figures. “These figures are a call to urgent mission. I have no doubt at all that the Archbishops, together with the whole leadership of the Church of England, are doing all they can to reverse this trend," he said as quoted by UK media. Islam has seen the biggest growth up from half a percent of the population in 1983 to 5 percent in 2014. Overall the number of people who said they belonged to a religion that was not Christian was up from 2 percent in 1983 to 8 percent in 2014 but the biggest group of the UK population is atheists who account for 49 percent. However, other Christian religions have remained stable. Catholicism, Methodists and Presbyterians, for example, remain at a similar level to that of 1983. Catholics constitute 8 percent and other Christian religions together constitute17 percent. Naomi Jones, Head of Social Attitudes at NatCen Social Research said in statement that the main explanation for the decline was “generational displacement”. “Each generation is less religious than the next so as older generations die the overall population becomes less religious,” she said. She pointed out that within Christian denominations, it was only the Anglican Church, which was continuing to decline and that immigration may be part of the explanation for this. “The numbers of Catholic and non-Christian people in Britain may have been supplemented by migrants with strong religious beliefs,” she said. She also said that fewer and fewer people see being a Christian as an important component of being British.